We, as a company, uphold the duty to give back to our community, both on a local and on an international scale. Therefore, we offer our employees three days a year in which they can choose an organization of their choice within which to do social work. In 2018 we carried out, collectively, over 30 days of social work. Here you can find some of the employee thoughts and experiences, upon reflecting on said work. 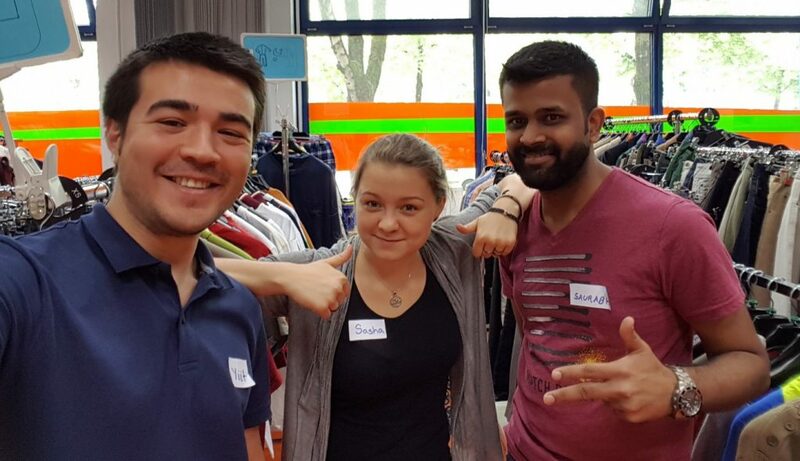 Four of our employees spent several days at the “Diakonie”, which is a social service offered by various Protestant churches. Their central concern is being close to the people who are in need of help and support. Adrianna spent one of her social days at the Isar Clean Up. An initiative which comes together once a year to clean the shore of the Isar, the river that flows directly through Munich. The goal is not only to clean the riverside, but to animate guests to dispose their own waste. For her “it was a nice experience, since I could engage on topics that I think are important for our direct future. I could meet a lot of inspiring people, do something without the laptop, and try to make our city / Europe a better and more healthy place”. Since we have a largely international team, two of our employees decided to do social work in their home countries. Socrates was volunteering at the event “Bring a blanket” initiated by Power Flow Studio, a yoga studio in Mexico City. He stated, that he enjoyed the experience. “It was a great opportunity to give back directly to the community and learn how to manage my time and work under relaxed, but limited circumstances, in order to make a small difference helping the homeless people. And also the people I met were very kind and supportive, that showed me the value of team work :)”. One of our bigger charity projects took place in November. We hosted the Annual Munich Chapter Charity Ball together with the Munich Irish Network and Globe Business College Munich to raise money for the Christina Noble Children’s Foundation which operates in Vietnam and Mongolia. Through this foundation children and their families receive healthcare and education. Furthermore, it empowers impoverished communities through community development programs. It was a challenging experience to organize the ball for over 200 guests but it was worth it to see so many people coming together for this cause. The following video will give you an insight to the evening. Since all of us had a positive experience through these experiences, we are looking forward to the new projects we will discover this coming year, 2019.